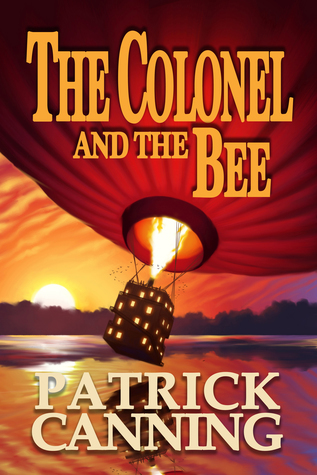 A brilliantly written story full of humor and wit, Patrick Canning’s The Colonel and the Bee features an epic “around-the-world” adventure with rather peculiar characters and a grand treasure hunt. After escaping her brutal life in the circus, Beatrix “Bee” becomes part of the Colonel’s crew on his flying ship and becomes entangled in a mystery adventure like none other. With a captivating plot and a rather humorous undertone, Canning’s novel displays the true essence of the steampunk and adventure genres in a splendid manner. Canning kindly asked me to review his novel during the summer, to which I honestly couldn’t refuse. The steampunk genre was one of my favourites growing up, and seeing the cover alone drew me to his work…and the fact that this is a standalone, which I was just simply not in the mood for more series based novels. Though I enjoyed my read, I unfortnately did not love it. HOWEVER, I firmly believe that true lovers of the steampunk genre will have a grand time reading Canning’s work. CONTENT & TRIGGER WARNING: This book contains moderate sexual themes, violence, murder (and subsequently death) and substance abuse. Though I have been enjoying my fair share of romance novels, I really wanted to find a book focused on the bond of family and friendship; Canning’s novel DID NOT disappoint! Though the main premise is adventure and a hunt of sorts, the plot also examines Bee’s discovery of the true meaning of familial love, something she doesn’t necessarily seek but finds in the end. The Colonel, Bee, and the Newlyweds’ (George and Thelma) connection is truly remarkable, almost in that heart-rendering way. Though none are related by blood, the band of friends will do anything for one another, even in the face of inevitable doom…which happens rather frequently thanks to the Colonel’s wild shenanigans. Oh my good word…the burst out in laughter moments! The banter between the George, Thelma, Bee and the Colonel brought me to tears! What I found best was that the humor comes from not these grandiose jokes but from the simple things, like the thoughts that come to their heads or the random acts they make that cause a catastrophe…and a need for a quick escape. Some people have mentioned that the Colonel is over-the-top in this department, but I LOVED this part about him. His character wouldn’t feel the same if he was as calm and collective as the other individuals. He reminded me greatly of a less socially awkward and more flamboyant Sherlock Holmes. Canning pays GREAT attention to language use, remaining true to the “would-be” time period rather than accidentally switching to more modern terminology. This goes hand in hand with the accents and terminology of different countries for many characters are from different areas of the globe. I don’t remember finding a single moment when Canning “missed” a section and accidentally switched back to modern day language use. This was in both the dialogue and descriptive sections of the story as well, which is even a BIGGER bonus. The characters are not only likable but fun to get-to-know. Each character brings a new element to the plot and making you want to continue reading the story. My favourites by far are the Newlyweds, George and Thelma (they aren’t actually Newlyweds…but they act like it). They’re a Scottish couple who are the parental figures in the book, especially to Bee and the Colonel. Though many people have some choice words regarding the Colonel…I LOVED HIM! There are parts in the story when all hope seems lost, when the Colonel suddenly appears with a solution. And when I say solution, I mean the most ridiculous and obscure solution there is that you don’t see it coming AT ALL. Bee is also a sweetheart, but she’s definitely not to be trifled with. At the tender age of 13, Bee’s able to defend herself and has NO quarrels with speaking her mind. Her thoughts towards the Colonel’s extra curricular activities are just splendid. Even the “villains” were entertaining, full of interesting back stories. Though I enjoyed the side characters, I found there was a lack of depth to the Colonel and the Bee. They are wonderful characters, don’t get me wrong…but I never felt truly connected to them. I wanted to, but there was a lack of substance among these two in particular. I would have liked more of a focus into their lives and their character growth. What’s brilliant about The Colonel and the Bee is the amount of world exploration occurring; however, there was a lack of descriptions and insights into these places. This wasn’t always the case, but there are a number of locations that I didn’t fully have a grasp at its appearance and characteristics. I’m not sure WHAT it is, but there was something missing that didn’t make me LOVE this story. I feel THIS is the part where I’m very biased and truly feel many people will love The Colonel and the Bee. Canning’s story is intriguing, with a beautiful attention to his writing style and the constant growth of the plot. But for some reason, I kept losing interest. Maybe the steampunk and historical fiction genres aren’t as much my cup of tea anymore. The Colonel and the Bee was a fun filled read, full of witty commentary among a cast of wonderful characters who somehow manage to CONSTANTLY get themselves into rather peculiar situations. The adventures of the eccentric Colonel, the fiesty Bee, and the “adorable beyond possible” Newlyweds are just spectacular, creating this need to read in order to discover what happens next. Mixed with the steampunk element and a touch of mystery, what’s not to like? Announcement | 500 Followers Giveaway Winner!